Community Arts Partnership hosted a visual awareness training for community arts projects’ facilitators. 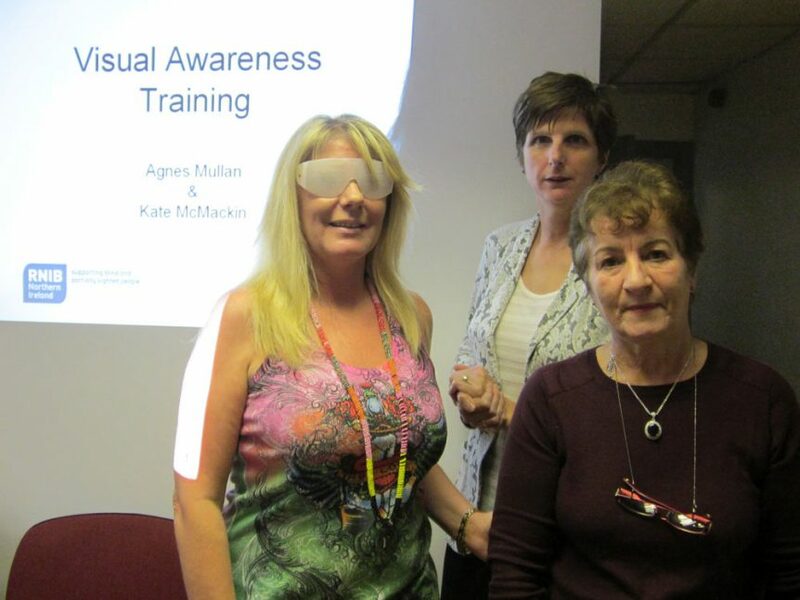 The training was delivered by Agnes Mullan and Kate McMackin from RNIB (Omagh Office). Agnes and Kate provided information about medical conditions affecting those who are blind or partially sighted. They also provided special glasses so that participants could have a first hand experience of what it is like living with sight loss, from walking, to sitting on a chair or completing simple tasks like counting money or reaching for a cup of tea. Plenty of advice was given on how to work, talk to and help people with sight loss. Special tips were given on how to work with them on arts projects, e.g. when talking about colours or patterns, or choosing suitable materials, tools and equipment. We all found the training very informative, relevant and enjoyable. More information about visual awareness training can be found at www.rnib.org.uk.